Like most of the Intex pools, the Intex 15ft X 48in Metal Frame Pool Set is very well priced. This is probably one of the biggest advantages that come with this product. It looks nice and feels sturdy because of the laminated sidewalls. It is spacious and can become the perfect backyard. Intex also offer a large array of add-ons and replacement parts, which will spare you a lot of time while shopping. The delivery package also comes with a very handy DVD that provides all the information needed to effortlessly put together the Intex 15ft X 48in Metal Frame Pool Set. This particular above ground pool is excellent for the whole family. It is sturdier than expected considering the price. It is built with strong steel frames that are durable and rust-resistant. The Intex 15 x 48 Pool will maintain its fresh looks for a long time because of the materials used. The sidewalls come with a patented structure called SUPER-TOUGH which will keep the frame legs in place. The design is also very nice as well as spacious. Assembly is not a one man job, but it is still pretty well thought out compared to other similar products. The price to size ratio is pretty great. The Intex pool is quite spacious and can be bought at half the price most pools this size goes for. It is also very sturdy because of its special design that incorporates steel framing. This provides an increased safety level and can also mean the pool will last longer. Usually, pools that are this big and lack proper reinforcement deteriorate pretty fast because they cannot hold their weight. When it comes to structure, the Intex metal frame pool includes patented designs such as the Super-Tough laminated sidewalls that are super strong. Intex used three separate layers of material in order to increase durability. Even if it may sound strange, the DVD that comes with the Intex swimming pool is another big advantage. Most pools become very annoying because of the complicated assembly process that is not explained properly. This is not the case with the Intex pool. The Intex 15ft X 48in Metal Frame Pool Set offers great value for money in terms of both durability and space. It is very hard to find a pool that can handle up to 10 people at once, while price is at that cheap. Another great thing about this swimming pool is that it comes with included add-ons such as the ladder, the drop cloth or the pool cover. All these are usually sold separately with other pools that cost three times as much. There haven’t been any problems with this metal frame pool yet. It is well-built, fun to have around and very well priced. There were some issues with the pump, but those are considered isolated incidents. I personally used this pool and the additional pump that is a universal fit and no problems emerged over the past years. Setting up the Intex 15 x 48 pool usually takes 50 minutes if you follow the instructions that come with the delivery package. Don’t try doing it yourself and most importantly, don’t start assembling it if you notice parts is missing. If such a thing happens, contact Intex customer service and wait for a response. They act quickly and are also very efficient. Other than that, there is not much to say except for the fact that you should not try assembling it if you don’t have a plane surface in your backyard. 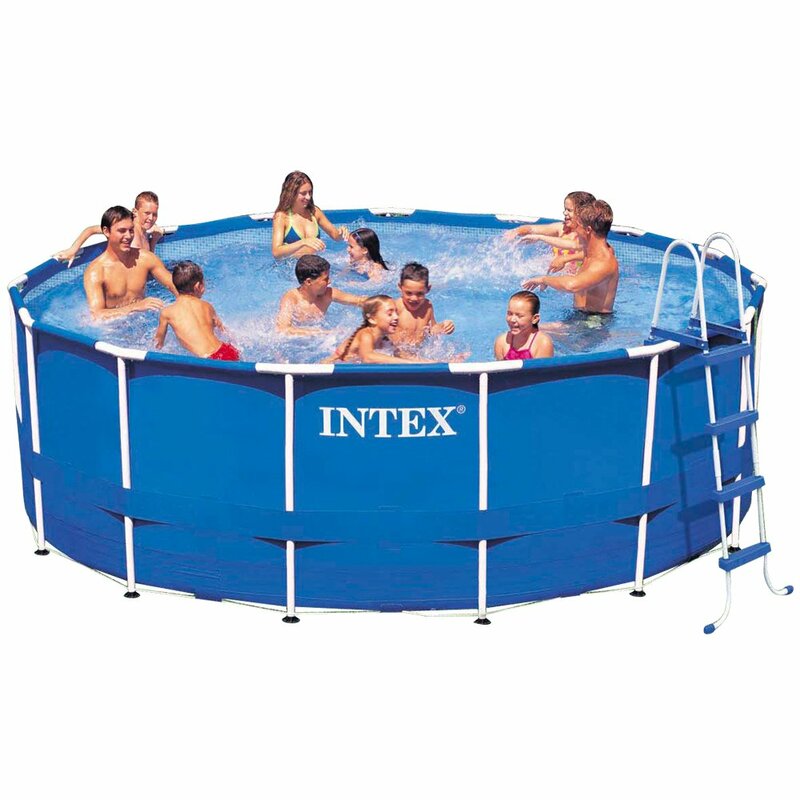 I like the Intex 15ft X 48in Metal Frame Pool Set, quite a lot especially because of the price. After years of reviewing similar and related products I can say this provides great value for money. It looks decent and it feels very durable, which is in my opinion one of the most important characteristics a pool such as this should have. The people who built this recommend purchasing a pool volleyball game, the river run I, underwater fun balls, a solar pool cover, a whale ride-on, LED Pool-Wall light, jumbo beach ball and much more. This is an awesome buy. It is a durable product that is very spacious. Those two characteristics are what you should look for in a pool. The price is just right considering it also comes with some nice accessories. The Intex 15ft X 48in Metal Frame Pool Set is a highly affordable product that is worth the money. It will provide some great times during the summer for you and your friends and it will keep on doing so for years to come considering the quality of the materials used to put it together. If you are looking for an above average pool in terms of size that does not put a dent in your budget, you should check out the Intex pool.